For parents specifically, even a few days in pretrial detention means having to navigate child welfare services—which can entail even more financial burdens. Starting in June 2018, Oklahoma became the state with the nation’s highest incarceration rate. The first time Sonya Pyles was arrested, she was 19 years old. She managed to avoid prison and instead was sentenced to six years of probation. But with that sentence came court-imposed fines and probation fees. 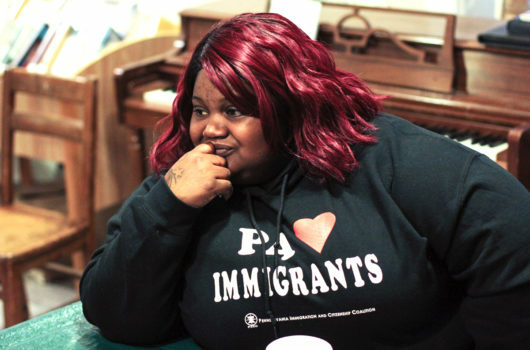 “I was expected to pay monthly probation fees and no less than $100 a month [for those six years] in court costs and fees,” she told Rewire.News. That was 24 years ago. Today, the 43-year-old mother of three is still struggling to pay those fines. And she’s not alone. A new report by Human Rights Watch, “You Miss So Much When You’re Gone’: The Lasting Harm of Jailing Mothers Before Trial in Oklahoma,” draws on more than 160 interviews with jailed and formerly jailed mothers, substitute caregivers, children, attorneys, service professionals, advocates, and jail officials to show how Oklahoma’s jail policies can snowball into insurmountable debt, unrealistic payment plans, and pathways back behind bars. For people of all genders, pretrial detention not only means a loss of liberty; it can also lead to loss of employment, housing, and access to health and social services. But for parents specifically, even a few days in pretrial detention means having to navigate child welfare services—which can entail even more financial burdens. Starting in June 2018, Oklahoma became the state with the nation’s highest incarceration rate. But it’s held the dubious distinction of having the nation’s highest female incarceration rate for years—no small feat in a country where the rate of women’s incarceration has continued to grow. Part of this explosion is the ballooning of the number of women in jails, from approximately 8,000 in 1970 to nearly 110,000 in 2014—a 1,375 percent increase. In contrast to prisons, jails typically hold people who are awaiting trial, sentenced to short periods of incarceration, or awaiting a transfer to state prison. Sixty percent of women in jails nationwide have not been convicted of a crime and are awaiting their day in court. On any given day, Oklahoma’s jails hold more than 12,000 people; of those, 1,905 are women, making up 151 of every 100,000 women in the state. Why are so many women behind bars even before being found guilty of any legal wrongdoing? Part of the problem is bail: a monetary amount set by a judge to ensure that a person will return for future court dates. The average bail amount set for women in Tulsa County, where Pyles was detained, is $13,675. In Tulsa County, women spend an average of 18 days in jail before being bailed out—and that’s if they’re bailed out at all. The report found that more than 400 women ultimately had their cases dismissed, typically after spending 21 days behind bars. A 2015 report by the Prison Policy Initiative found that the median annual income of an incarcerated person before arrest was $19,185. That in and of itself doesn’t leave much money to be saved for an emergency, like posting bail or paying for an attorney. Then there’s the gender pay gap—the median pre-prison income for an incarcerated woman was $13,890 compared to $19,650 for men. Incarcerated white women earned a median $15,840 before imprisonment, which again doesn’t leave much room to save for emergencies. Women of color earn even less: Incarcerated Black women earned $12,735 prior to arrest (compared to Black men’s $17,625). Incarcerated Latinas earned $11,820 (compared to the $19,740 of their male counterparts). This means that many women can’t afford the price of pretrial freedom. The Prison Policy Initiative report found that many judges in Oklahoma do not make an individualized determination on whether the person poses a flight or safety risk, or had family and community ties. Instead, they set bail according to a district court bail schedule, which provides presumptive amounts of bail based on the charges. That means that bail can vary from district to district. In Tulsa County, where 76 percent of the jail population is held pretrial, bail for possession of a controlled drug (considered a felony) is $5,000. For robbery (also a felony), bail is $25,000. In Oklahoma City, bail for a robbery charge is four times higher: $100,000. That’s the amount that a judge set for April Weiss, a mother of three. Her family was unable to afford even a fraction of that amount, so Weiss sat in jail for eight months awaiting a series of court dates that were scheduled one to two months apart. Those months came with a steep cost. Weiss’s mother and aunt cared for her children, thus allowing the family to avoid being entangled in the foster care system. But Weiss still lost custody of her oldest daughter in 2014 after the girl’s paternal grandparents filed for custody. Weiss, who was in jail at the time, was given no notice of the hearing and so was unable to participate in the family court proceedings. The grandparents were awarded custody and cut off all contact between mother and daughter. Weiss has not seen or spoken to her daughter, now age 13, for the past five years. The Annie E. Casey Foundation found that 12 percent of children in Oklahoma, or 108,000 children, have a parent or guardian who has ever been incarcerated. A 2014 study of women in Oklahoma prisons found that 68 percent had a minor child; two-thirds had been living with their children at the time of their arrest. Nearly half of the women living with their children had not been living with a partner; nearly 58 percent of these children were now living with family or friends and nearly 10 percent were living in foster homes or agencies. And almost 12 percent of incarcerated mothers reported that they did not know where their children were. But this recent study only covers mothers in the state prison system who responded to the survey. No one knows the exact number of parents incarcerated in Oklahoma—or throughout the nation. Parental status is not systematically tracked or published on the local, state, or national level. “There is no requirement to track and publish the parental status of people in jails and prisons, which is why one of the recommendations in the report is to pass legislation that will require this data to be collected and made publicly available,” jasmine Sankofa, the Aryeh Neier fellow at Human Rights Watch and the report’s author, told Rewire.News. Not only did Weiss lose contact with her children (and custody of her oldest daughter), but her jail stay incurred daily fees that quickly added up to a nearly insurmountable bill. Like 15 other jails in the state, the Oklahoma County jail charges a daily fee to the people in custody. Thus, those whose families are unable to post bond are still on the hook financially even after their release. “They give you a bill as you’re walking out,” Weiss told Rewire.News. “If you don’t pay it, they issue a warrant for you.” Weiss was arrested and jailed three times for her inability to pay for her months behind bars, which, at one point, totaled $35,000. “If I didn’t have to wait so long between court dates, I wouldn’t have acquired so much debt,” she commented. Each time, Weiss spent approximately two weeks in jail before appearing before a judge, who issued a payment plan. Though her family took care of her children during those times, those two weeks caused her to lose her apartment. “It’s an extra bill added on,” reflected Weiss. “You get out and you’re a felon, so it’s not like a lot of places will hire you.” She’s not alone in this conundrum. Weiss now lives in sober living housing with ten other women, each of whom is trapped in a similar debt for past jail stays. The financial clock doesn’t stop ticking if a person is convicted and sent to prison. The Tulsa County Jail, where Pyles was detained, does not charge people in custody a daily fee, but that does not mean that people escape criminal justice debt. Five years after her first arrest, Pyles was arrested again, this time sentenced to six years in state prison. She served three years in prison before being paroled. When she was released, she found that her debt had been steadily accumulating during her time in prison. “It was thousands of dollars,” she told Rewire.News. She had 24 hours upon release to set up a payment plan and 30 days to begin making payments. It didn’t matter that she earned no money in prison and therefore was unable to pay down that debt. It did not matter that her felony conviction made it more difficult to find a job, let alone one that paid enough to support her, her three children and one grandchild, and still make those payments. It didn’t matter that Pyles, who had been arrested because of her drug dependence, had received no drug treatment in prison. “I’m [still] expected to get a job immediately and start paying the fees.” On top of that, Pyles was now responsible for parole fees as well. “At one point, it was $23,000,” she recalled. “I would often choose to pay my bills and keep a roof over our head and feed my children and hope to find a way to pay those fines,” Pyles said. But when she wasn’t able to pay, she was arrested and jailed. “I had to wait weeks, sometimes a month, before I could go before a judge and beg for a new payment plan and hope to be released,” she recalled. Meanwhile, her mother and uncle were stretched thin caring for Pyles’ three children and toddler granddaughter. Both Pyles and Weiss had family members willing to care for their children during their incarceration, thus avoiding entanglement with the state’s foster care system. If their children had been placed in foster care, they would have been at risk for having their parental rights terminated. Under the 1997 federal Adoption and Safe Families Act, child welfare agencies are required to start proceedings to terminate parental rights if a child has been in foster care for 15 of the past 22 months. 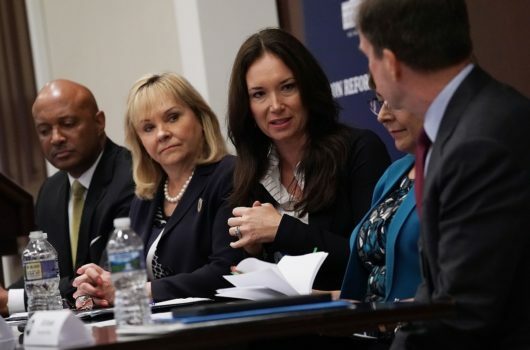 In Oklahoma, mothers with children under the age of 4 face an even more onerous timeline—if the child has been in foster care for six of the previous 12 months, the state must begin proceedings to terminate parental rights. Though the state’s child welfare agency may provide referrals, funding, or vouchers to help parents meet these conditions, not every service may be covered. This pushes parents deeper into debt. They may also be required to pay child support to the state, if their children are in foster care, or to the custodial parent. Failure to pay can mean another arrest and incarceration or having parental rights terminated. The report urges lawmakers to eliminate, or at least substantially reduce, a reliance on money bail. It also urges them to pass legislation that substantially reduces court fines and wholly eliminates fees and court costs. At the very least, legislation should require that courts consider primary caregiver status when deciding whether to reduce fines, fees, and court costs, or when setting up payment plans, the report notes. Weiss agrees. She now works as a forklift operator and continues to pay $50 each month because of those past months in jail. If not for those payments, she would be able to take her younger two children out to explore the city as a family. “I’ve missed so much,” she lamented. But, with the debt—and the threat of being sent back to jail—hanging over her head, those outings will have to wait.